"The question with which we must deal is not whether a substantial proportion of American citizens would today, if polled, opine that capital punishment is barbarously cruel, but whether they would find it to be so in light of all information presently available." In 1996, the Death Penalty Information Center established the Thurgood Marshall Journalism Awards to recognize those writers and producers who have made an exceptional contribution to the understanding of the problems associated with capital punishment. 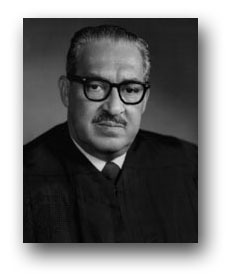 The award is named in honor of former Supreme Court Justice Thurgood Marshall, a champion of justice, who believed that a well-informed public would ultimately reject the use of the death penalty. The Thurgood Marshall Journalism Awards have been discontinued as of January 2009. Thank you to all who have expressed interest in this program. Print: Gary Fields, The Wall Street Journal, "Criminal Mind"
Video: Alan Johnson, The Columbus Dispatch, and Eleanor Hayes, Amy Rogan, Jamie Walters and Jeff Gostomski, The Ohio News Network, "Deadly Convictions"
Innocence: Steve Mills and Maurice Possley, The Chicago Tribune, "Did This Man Die for This Man's Crime?" Print: Carla Crowder, The Birmingham News, "Mother Finds She Can Accept Son's Date with Executioner"
Innocence: Steve Mills, Maurice Possley, Chicago Tribune, "Texas Man Executed on Disproved Forensics"
Video: Katy Chevigny, Kirsten Johnson, "Deadline"
Print: Alex Kotlowitz, The New York Times, "In the Face of Death"
Print: Steve Mills, Maurice Possley, Don Terry, Chicago Tribune, "The Legacy of Wrongful Convictions"
Audio: Karen Callahan, Matthew Ozug, SoundPortraits, "Parents at an Execution"
Video: Ofra Bikel, "Burden of Innocence"
Print: Rebekah Denn, Lise Olsen, Seattle Post-Intelligencer, "Uncertain Justice"
Audio: David Isay, SoundPortraits, John Keefe, Gary Covino, WNYC, "The Execution Tapes"
Video: Bill Kurtis, A&E Network, "Investigative Reports: Death Penalty on Trial"
Print: John Shiffman, The Tennesseean, "Judgment Day"
Audio: David Isay, Stacy Abramson, SoundPortraits, "Witness to an Execution"
Print: Ken Armstrong, Steve Mills, Chicago Tribune, "The Failure of the Death Penalty in Illinois"
Print: Eric Bates, The Independant, "Shadow of a Doubt"
Print: Dan Malone, Howard Swindle, Dallas Morning News, "America's Condemned, Death Row in Their Own Words"